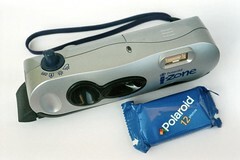 The i-Zone was first released by Polaroid in 1999, and a new format of Polaroid film was released alongside these cameras which produces a print measuring 24mm×36mm (the same size as a 35mm film negative). 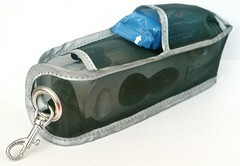 I-Zone (or 'Pocket') film is an integral film (such as SX-70 or 600) but the film pack contains no battery, therefore the prints must be manually pulled from the camera in a similar way to the old Packfilm cameras. The i-Zone was a fixed focus, fixed shutter speed camera with selectable apertures for different shooting conditions. Like many recent consumer Polaroid cameras the flash fires for every shutter release, and cannot be disabled. I-Zone cameras were marketed towards children, with various stylings and revisions over their lifespan. I-Zone film came in a couple of varieties (notably a sticker-backed version that revealed hidden messages on the print as it developed) and the cameras seem to have been designed primarily for portraiture, with the fixed focal distance covering a range between 2 and 8 feet.